Sparkling lemon tea gets a spicy makeover. 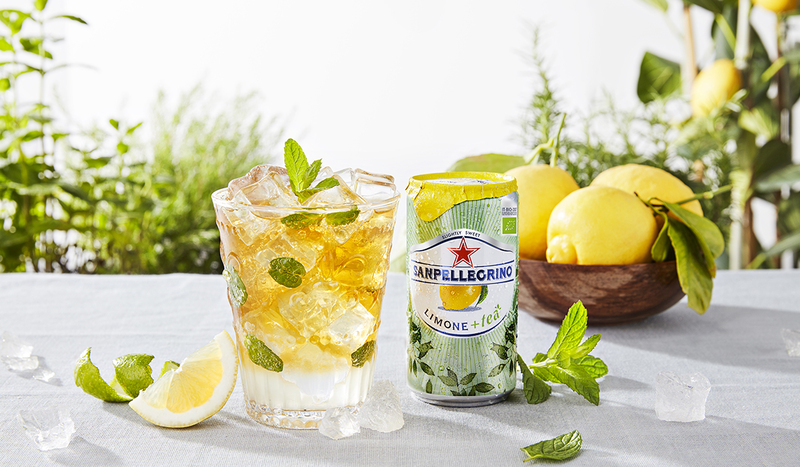 Tangy and exotic, Sanpellegrino Limone+tea meets its match in the Lemon Cardamom Sparkler mocktail where fragrant cardamom’s minty and citrusy flavours are perfectly complimented with fresh mint, lime and lemon. Lemon Cardamom Sparkler may sound a bit sophisticated, but it has the Italian spirit at its heart – so enjoy it with friends for a convivial afternoon under the sun. S.Pellegrino Limone+tea’s sparkling lemon flavour and hint of organic tea is perfect with the sweet aroma of cardamom in the Lemon Cardamom Sparkler mocktail. Tart lime comes through in the end to round off the palette and makes the Lemon Cardamom Sparkler so easy to sip. The pairing of cardamom and mint brings an added lightness to the citrus in this drink, and is the ideal companion to casual snacks and sharing dishes such as pettole, stuffed squid or even a simple carpaccio. Pour the syrup and juice into a tall glass (14 oz/40 cl capacity). Add the mint and muddle it slightly using the back of a spoon. Fill up with ice, top with Sanpellegrino Limone+tea and stir well to combine. Garnish with additional mint leaves and serve immediately. If you are 18 years old or over you can turn the into an alcoholic drink by adding 1 oz/3 cl of passionfruit or ginger liqueur and stirring well before serving.